Adhering to the Party’s views on the two strategic tasks of building and defending the Motherland in the new situation, the Party Committee and people of Ba Ria - Vung Tau province have promoted their socio-economic development in combination with strengthening defense and security to make it an industrial province which is powerful in marine economy, stable in politics, and strong in defense and security. Over the past years, Ba Ria - Vung Tau has mobilized all resources and brought into full play the combined strength of the entire political system, forces, and people. The province has considered the armed forces as the core to promote the construction of the all-people defense posture attached to the people security in each region and in the whole province, ensuring that the socio-economic development will gradually strengthen the national defense and security potentials of the province. The Resolution of the 6th Provincial Party Congress (term 2015-2020) has identified "to attach importance to closely combining socio-economic tasks with national defense and security and foreign affairs with foreign trade to maintain the position and create more motive forces for the defense zones of the province with much attention paid to combat facilities, equipment, and conditions for the armed forces." Based on its own characteristics, potentials, and strengths, the province has advocated the development of industry, marine economy, seaport services, and tourism. Besides, the province has also concentrated on building the system of technical infrastructure, works and projects, especially projects on marine and island socio-economic development to meet the objectives and requirements of combining socio-economic development with defense and security in the province. At the same time, mechanisms and policies have also been studied, renewed, and supplemented to create a legal corridor to attract domestic and foreign investment in the construction of socio-economic infrastructure and facilitate the implementation of other economic-defense projects. During the course of implementation, the province has attached importance to investing in the development of spearhead economic sectors, such as: seaport services, aquatic product exploitation, post and telecommunication, health care, or transportation to serve the socio-economic objectives and meet the defense requirements, more directly defensive structures, combat bases, and logistics and technical bases in defense zones. Currently, socio-economic projects, industrial zones, and material production facilities (gas, chemicals, brick and tile, steel, etc.) have been verified and attached to defense and security assurance. In addition to oil and gas exploitation, the province is also one of the centers of energy and tourism of the country, with a system of seaports and river ports of great potentials which are being exploited and promoted effectively to develop the economy and strengthen the defense potentials in the area. The road and waterway transport systems are relatively developed, facilitating the socio-economic development and playing an important role in for defense and security. As a coastal province with more than 156 km of coastline, Ba Ria - Vung Tau has both advantages and difficulties in socio-economic development, defense and security strengthening. At sea, the security and order situation is complicated as acts of infringing upon the sovereignty, illegal fishing of foreign vessels, invasions of the marine environment, or smuggling, etc. occur frequently, which, if not dealt with properly, will be the risks of instability. To overcome such situation, the province has accelerated propaganda and education, creating a unity of awareness in leading, directing, and organizing the implementation of socio-economic development tasks in association with national defense and security. All guidelines, views, contents, and solutions for combination have been concretized in the directions and resolutions of the Provincial Party Committee and the Provincial People's Committee on the task of economic development associated with defense and security maintenance during the term and in each year, in the general planning and master plans for socio-economic development and construction of defense zones, departments, branches, and localities. Together with thoroughly grasping the Resolution of the Fourth Plenum of the Party Central Committee (the 10th Congress) on Vietnam's sea strategy towards 2020, the province has taken initiative in reviewing the promulgated policies and regimes, including the policy to combine offshore fishing with sea and island protection, implemented policies to attract forces to participate in development of the marine economy and maintain security and order on the sea, and directed the coordination of activities of the forces such as local army units, Border Guard, marine militia, and Navy, Coast Guard, and Fisheries Resources Surveillance. In addition, the province has also intended to continue researching and adopting preferential policies for enterprises and fishermen participating in the defense and security tasks on the sea and islands. Propagation and education have been combined with regulations on ships and boats operating on the sea to take part in protecting marine security, order, and sovereignty and rescue and environmental protection activities. At the same time, specific preferential policies have been applied to island districts, attaching importance to building up forces and mobilizing islanders to well perform the national defense and security work under the guideline that everyone is obliged to protect the sea and islands. Building provincial and municipal defensive areas is the strategic policy of the Party, aiming at strengthening all capabilities of localities to meet the local requirements and protect the Motherland in the new situation. Thoroughly grasping that spirit, the province has directed all branches, levels, and forces to seriously implement Resolution No.28-NQ/TW of the Politburo (the 10th Session) and Decree No.153/2007/NĐ-CP of the Government on building defensive areas. The military offices at all levels have actively coordinated with the police and functional branches in organizing the appraisal of key projects in industrial parks and clusters, Cai Mep - Thi Vai port, and Con Dao district to ensure the requirements of socio-economic development and strengthen the national defense and security. Based on the surveys and studies on the natural geographic conditions (hills, plains, seas, and islands), the province has focused on constructing the military posture of the defense zones, especially defense and combat works to meet the requirements of "practicality, efficiency, and cost-effectiveness" and complete the planning on construction of coastal combat defense works in period 2017-2025 in conformity with the socio-economic development planning, goals, and requirements of local protection in both peacetime and wartime. At the same time, the province has also adjusted, allocated, and arranged population quarters, combat villages, and observation stations and managed the defense works and land, caves, heights, estuaries, coastal terrains, and islands with military value to create an “uninterrupted and solid” defensive posture. The local party committee and authorities have prepared documents and plans for combat operation, defense mobilization, air defense, flood prevention, search and rescue, and fire and explosion prevention. Scheduled exercises have been carried out for provincial and district defensive areas and communal (wards, towns) policing combat. Through the exercises, the province and districts (town) have promptly drawn experience in order to continue operating existing mechanisms and improving the leadership and guidance capacity of the party committees and authorities at all levels as well as the advising and coordinating capacities of departments, branches, and unions in the province. Additionally, the province has focused on building a strong and comprehensive armed forces capable of accomplishing their tasks. Accordingly, agencies and units have well performed the work of political and ideological education and building solid political will, stance, idea for officials and soldiers to overcome difficulties and be prepared for receiving and fulfilling all tasks assigned. To thoroughly comprehend the Resolution of the Fourth Plenum of the Party Central Committee (the 10th Congress) on building and reorganizing the Party and the Political Bureau's Directive No.05-CT/TW (the 12th Session) on promoting the study and follow of Ho Chi Minh’s thought, ethics, and style, the province has directed units to thoroughly overcome the degradation of political ideology, morality, lifestyle, "self-evolution", "self-transformation", and weaknesses which have been pointed out. The Determine to Win Emulation Movement in association with the Patriotic Emulation Movement and the campaign on "Promoting traditions and devoting talents to be worthy of Uncle Ho’s soldiers" has been promoted to create a solid change in all aspects of work, training, and self-improvement of cadres and party members and enhance the leadership, management, advising, and commanding of the party organizations and commanders at all levels. Much attention has also been paid to directing the consolidation of the organization and workforce of military units at all levels, reserve force, and militia, ensuring the quantity and quality as prescribed to meet the requirements on protecting the localities in every situation. 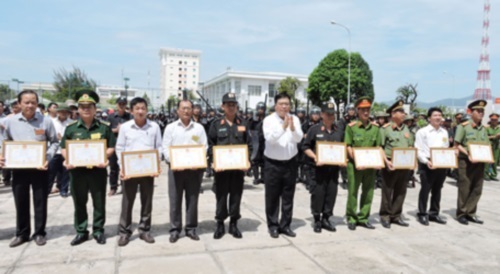 Socio-economic development in association with national defense and security and strengthening of national defense potentials is one of essential contents in the leadership and direction of Ba Ria – Vung Tau provincial Party Committee, the People's Committee. In the coming time, the province will continue to bring into full play its achievements and overcome shortcomings in this task in order to constantly increase defense potentials combined with socio-economic development, contributing to the course of building and protecting the Motherland in the new situation.